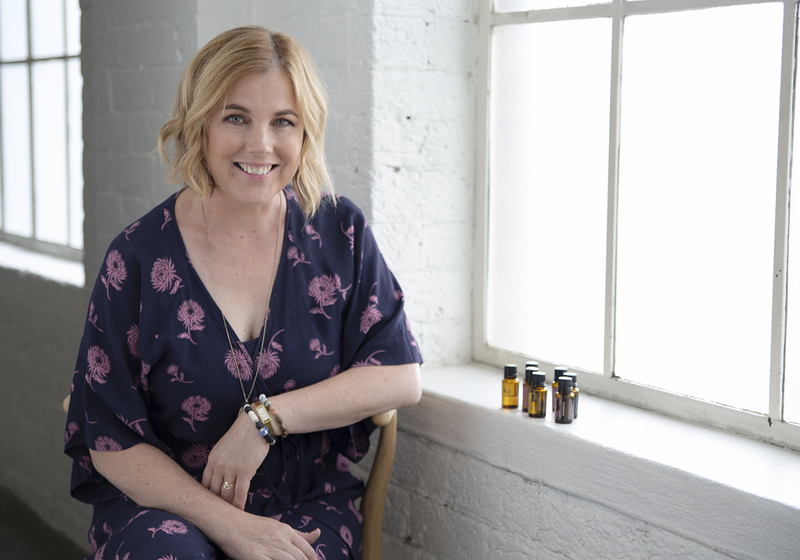 You are really excited that your oils have arrived- your oily journey has begun! Now, what on earth do you do with all these little bottles and how do you store them? Sure you can easily use a plastic food container but there have to be options out there that mean the bottles aren’t constantly falling over every single time you move, right? Help is at hand! I am an Oil Addict and a Neat Freak. 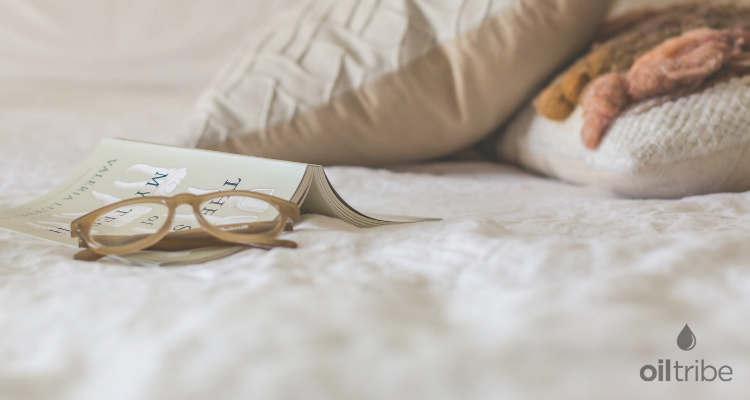 NOTHING makes me happier than having a place for stuff. 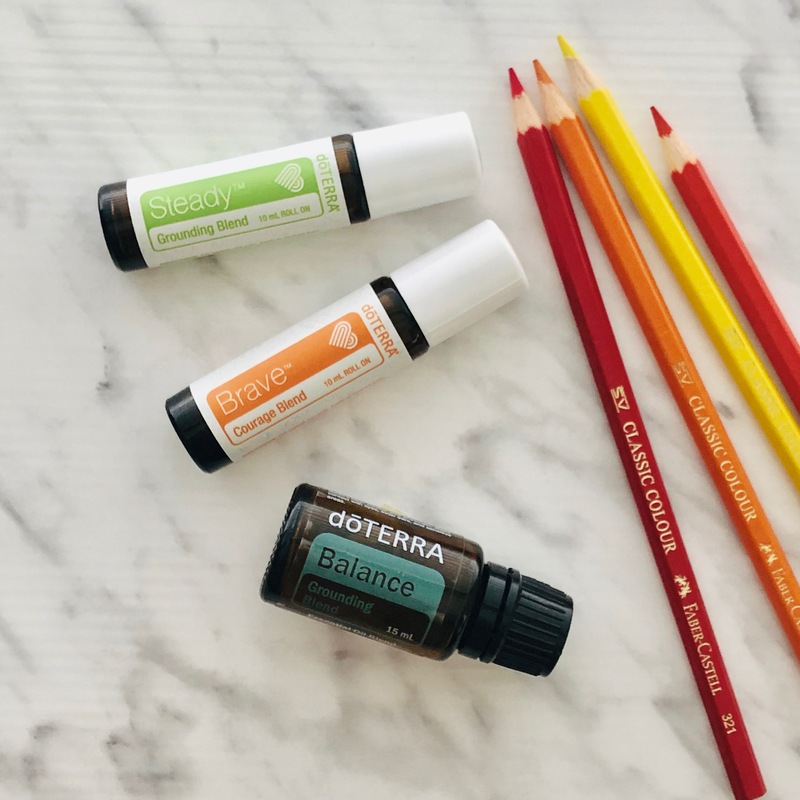 I have been using dōTERRA’s essential oils for 3 years now and I have tracked down some pretty good storage options to share with you. Remember though wherever you store your oils, make sure they are away from a heat source and out of direct sunlight. Here’s what I have used in the order I got them **please note the photos are AS IS. I thought it would be best to show them exactly as we use them, not prettied up for a photo**…. 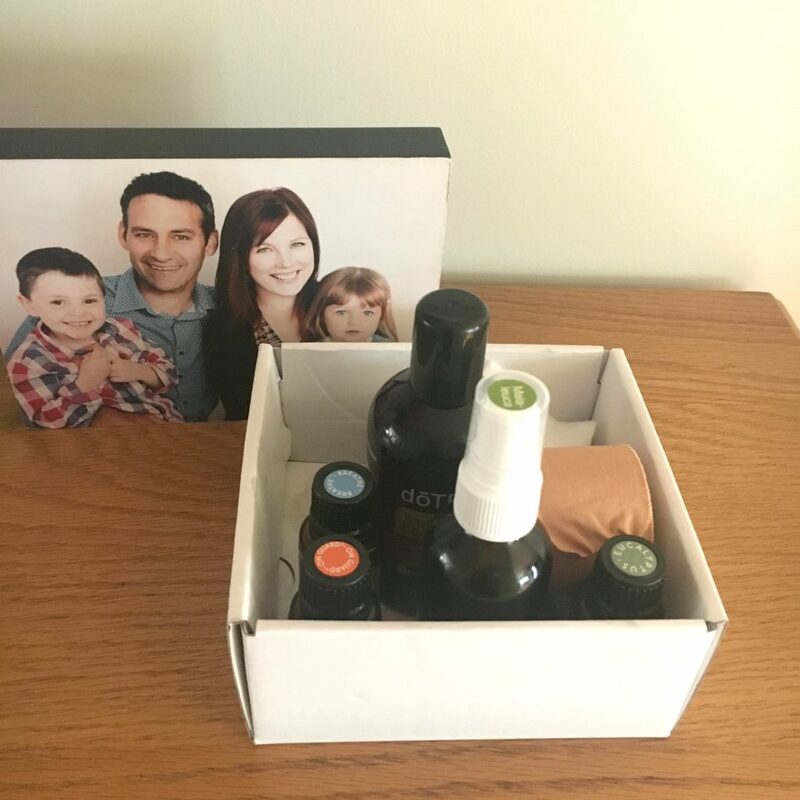 This wooden box is a perfect way to keep your oil collection safe in the early days. 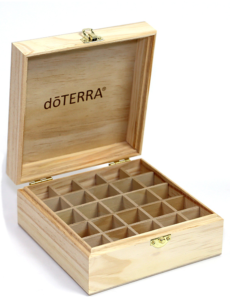 This little wooden box holds 24x 15ml bottles and will keep you going for some time. In the beginning I had two of these boxes and I loved them. You can remove the lids if you like to give you easier access to the oils. Or not, up to you. Cost: USD12.00 and can only be ordered via the US for New Zealanders and Australians. Quality: Fabulous, it’s supplied by dōTERRA after all! This was the second item I bought to store my oils in. I bought it long before I decided to do the business as I wanted something secure and safe to carry my oils around in. If you have an oil collection and work out the cost- a safe carry bag makes TOTAL sense. This bag has a stiff top and bottom and is fabric lined with foam inserts. It holds 66x 15ml or 5ml bottles and also has a row of 13 smaller holes along the front for storing roller balls. It zips up and has a shoulder strap. 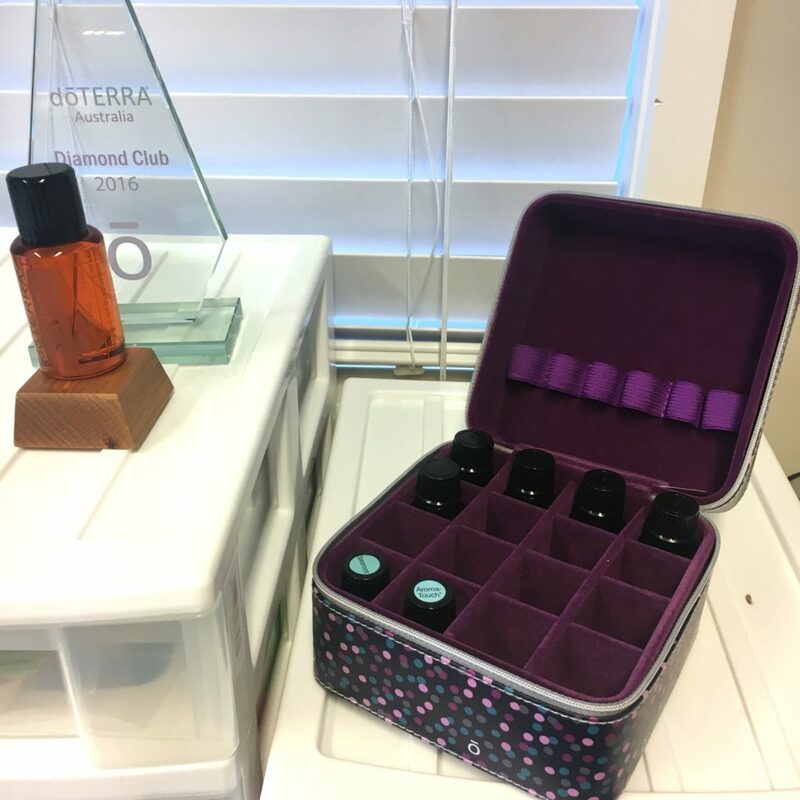 You can get different size cases like this but I like that this holds all the oils dōTERRA offer. Hint: Each foam hole has a round foam cylinder that you pull out to allow you to use the hole. Cut the foam cylinder in thirds and pop 1/3 into the holes you want the 5ml bottles to go in- this will raise the 5ml bottles to the same height at the larger 15ml bottles. OCD much? Oh yes. Quality: Really good, mine is till going strong after 2 1/2 years of solid use. I use my oils a lot downstairs and in the kitchen. I bake with them and this is the place where I apply morning oils to the kiddies. 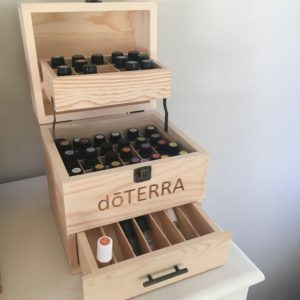 I was getting frustrated with losing oils and having them in random places all over the kitchen…so I got myself a box. 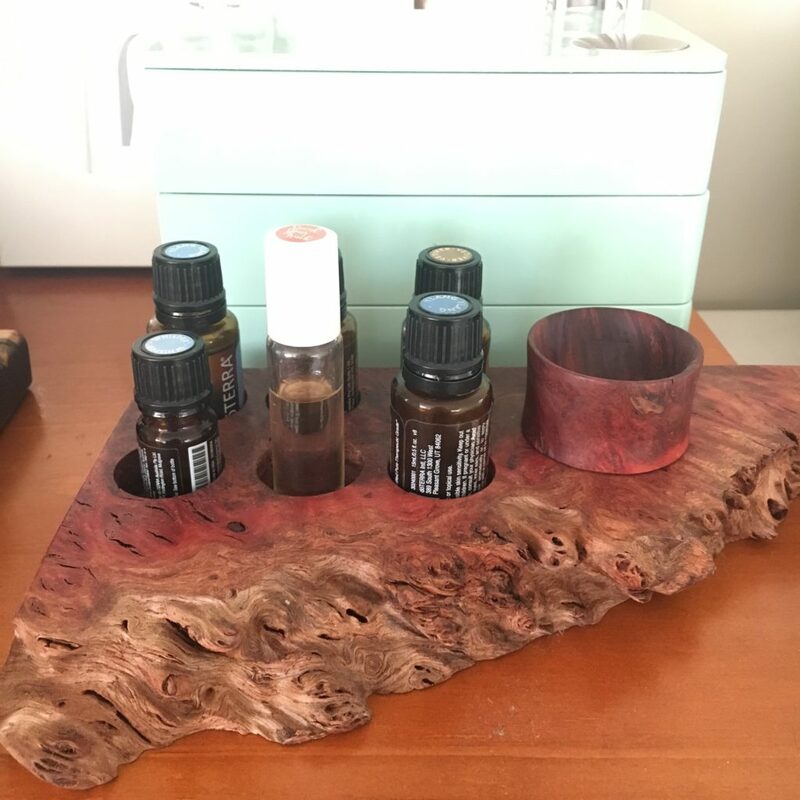 This little wooden tray has room for 36 oil bottles or roller balls. It’s small enough to tuck into a corner and I love it. Cost: US19.95 excluding shipping from the US here, you will pay the same for shipping as the cost of the box (although this was worth it for me). This an option from the Aussie site, although is out of stock currently, I would remove the sliding top. 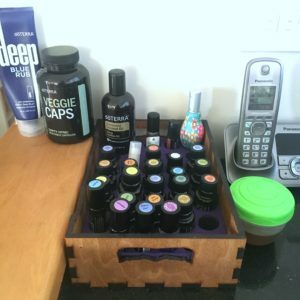 I am constantly on the look out for ways to contain my oils. 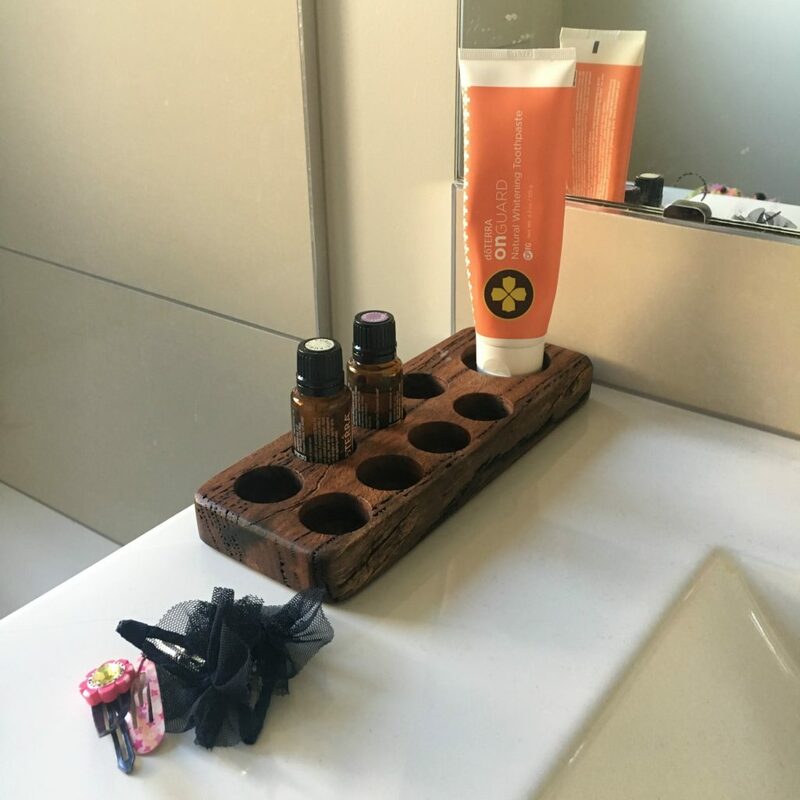 I always tell newbies to keep their oils in the place where they will use them- well, we use them in different places around the home so I need innovative ways to hold them. I keep my eye out and sometimes I see something that is not designed for oils but would be perfect for them! 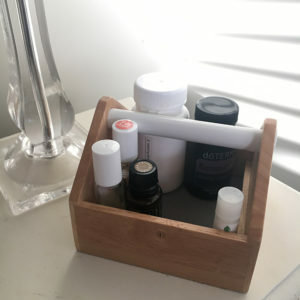 This little wooden try is small enough to fit on my bedside table and holds a couple of rollers, pills, Serenity sleep gels, an oil bottle and lip balm. I love it! I can’t recommend these enough!! And the polka dot case for the office. 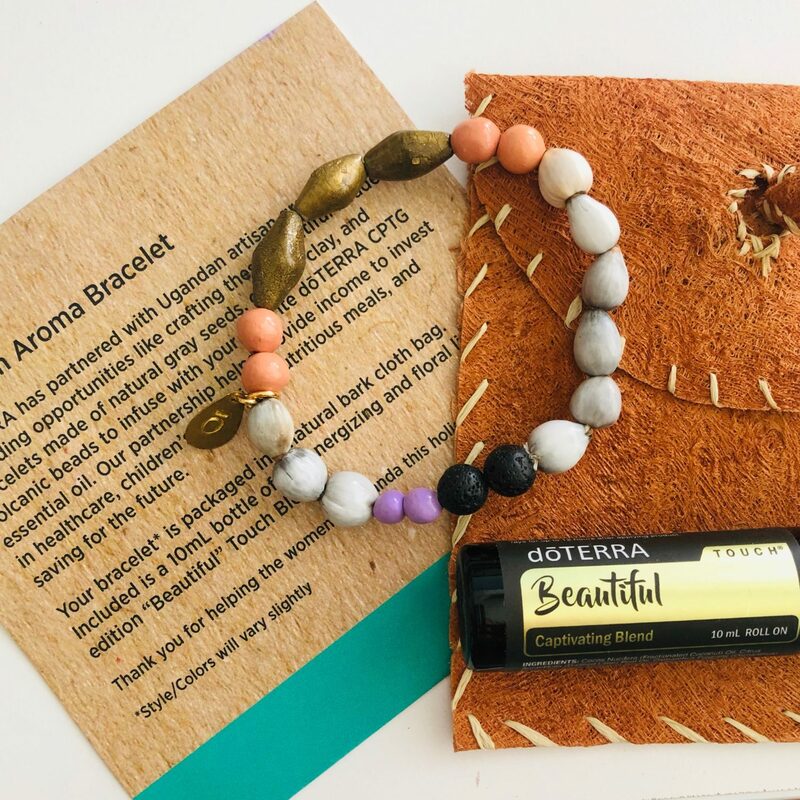 Quality: Really good, because….it’s dōTERRA. Using oils at home is one thing but I want to use them when I am on the go and out the house. This means roller balls for me as they easy to use, already diluted and mess-free. 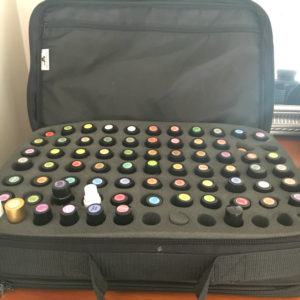 I have a roller ball case and then a roller ball or two in my cosmetic bag. The roller ball case was a limited edition case that I was gifted but keep an eye out for similar ones. Etsy has some great handmade roller ball cases. Make it up & Temporary Carry case. In a pinch there is nothing like using a small box. When we are sick, like we have been with a cold, I wanted all the oils I was using in one portable “thing”. 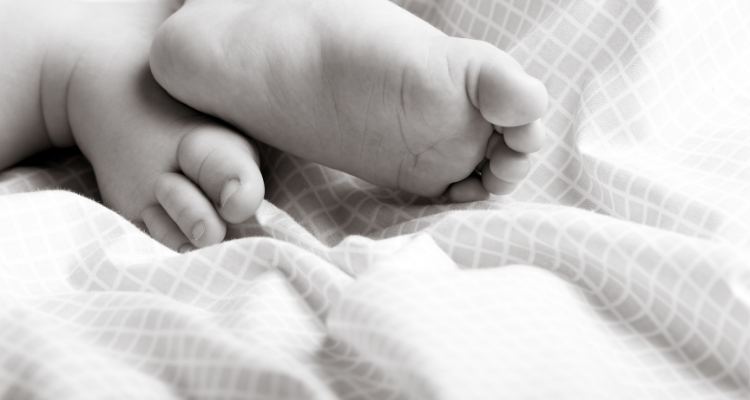 I needed the oils to follow the sick child around the house and be small and light and easy to move. I did not need a fancy-pants option as this was temporary. Another time you would use something like this is away camping as this box is pretty stable on a tent floor- first hand experience with this! This box comes straight of the Petal Diffuser box which has one of these top and bottom. So easy, so simple and cheap! Ok lovelies, hope that gives you some ideas! I am sure there are many more options out there, these are the ones I found and used with success. Watch for the quality of what you buy, you need to trust your carry case. If you are interested in getting the oils to go IN these carry cases, feel free to contact me and I would love to have you in the tribe!